The easiest way to recognize a cluster is that you enter a town and be greeted by countless forms and structures of one particular material. Although all the forms are different in structure but from your perspective – watching from the entrance of the town, the work seems monotonous. This monotony in the material and appearance helps in pointing out the place as a cluster of that particular craft. 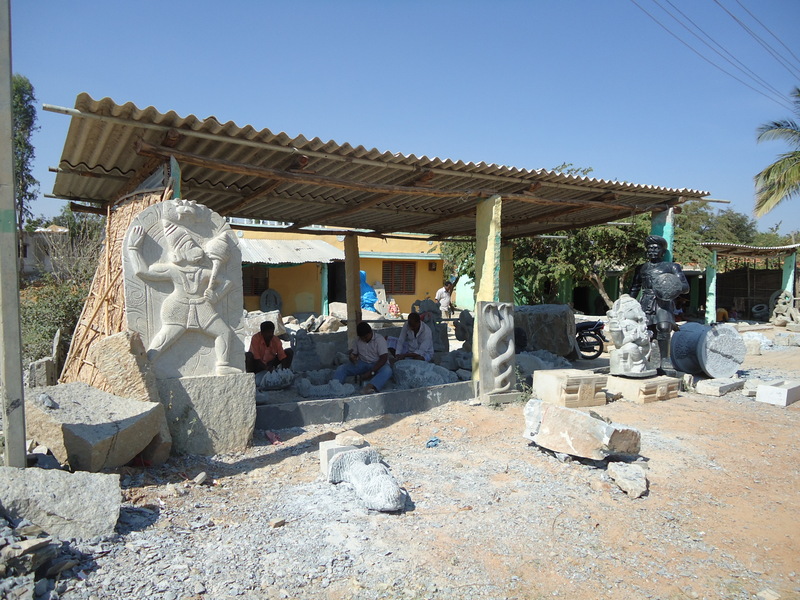 While standing at the gate of Shivarapatna, a village in the Malur Taluk of Kolar District in Karnataka, a similar sight of massive stone sculptures welcomed me and my friend Sree Lakshmi, and helped us confirm that we were standing at the right place – the land of stone sculpting, Shivarapatna. I have to admit that traveling to this town from Bangalore is not very easy. We took a bus from Majestic to Hoskote, from where we got a bus to Malur. 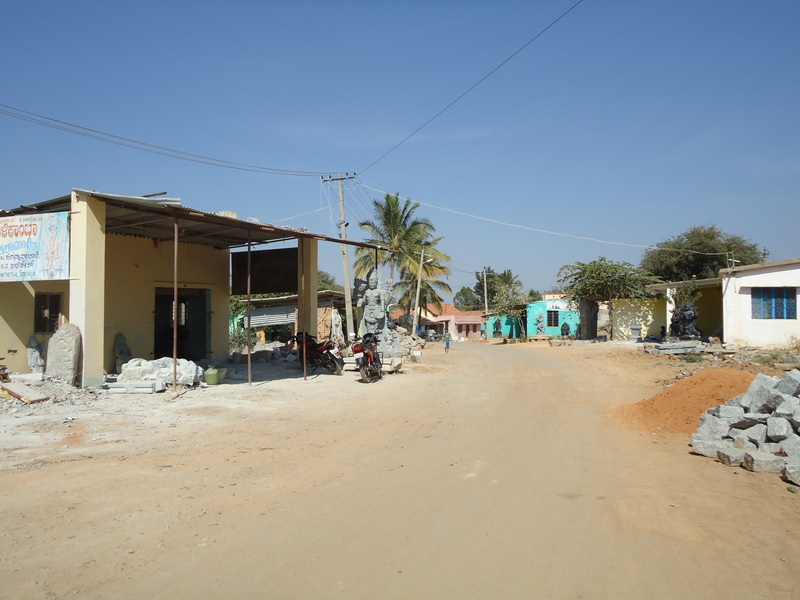 From Malur a bus to Shivarapatna gate and then an auto to reach the entrance of the Shivarapatna village. The deserted Shivarapatna gate leads to dumbfounderment as there does not exist any trace of public commute! Indeed huge autos which I have termed as ‘item’ autos (because of the way it is decorated from the inside) do follow this route at intervals of 5-10 minutes. 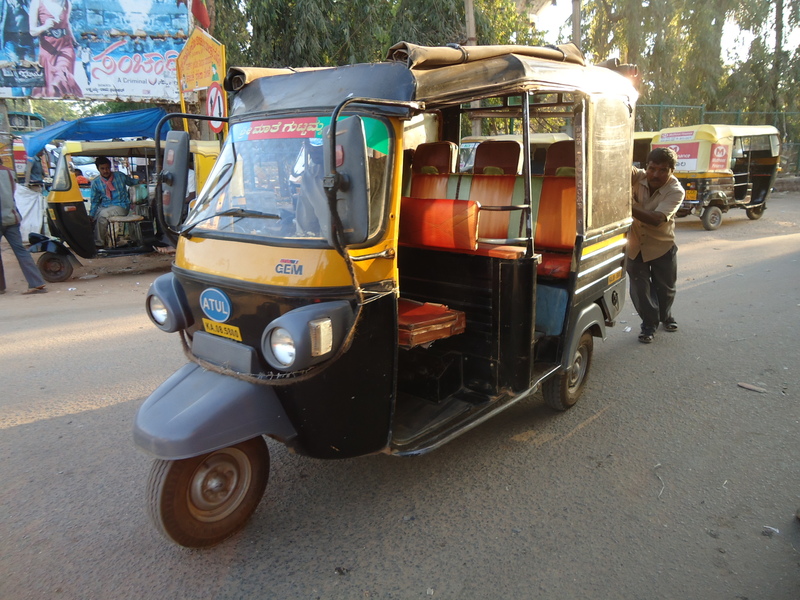 These autos can possibly accommodate 20 people at once and cost Rs. 10 per person. We got into one of these autos and reached the entrance of the Shivarapatna village from the Shivarapatna gate in 5 minutes. Although this route seemed difficult to follow, on our way back to Bangalore, we did discover an easier route. We took an auto from the entrance of the village until Malur bus station directly. From here, we got a bus to Bangalore, which goes until Majestic but we got down at Krishnaraj Puram Railway Station. 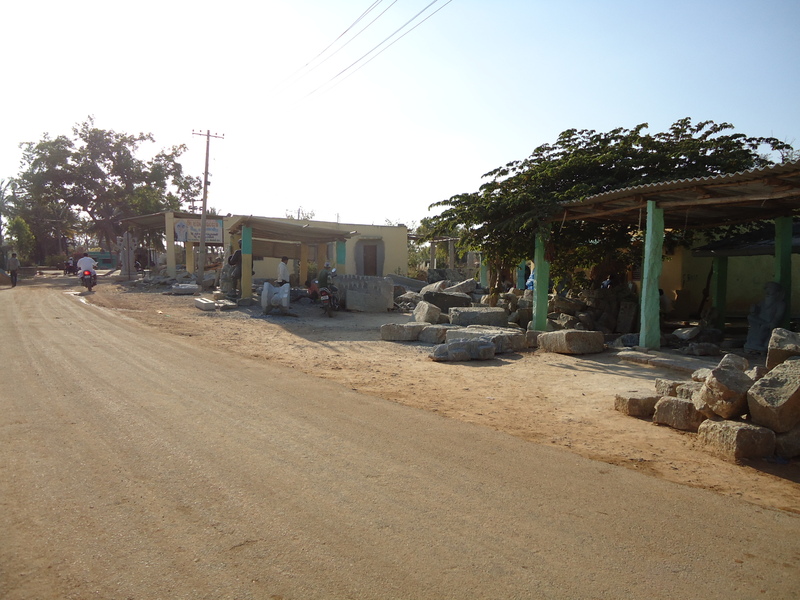 We reached Shivarapatna in two hours of journey from Majestic, Bangalore and were struck with amazement to see the whole village working on black and white stones. 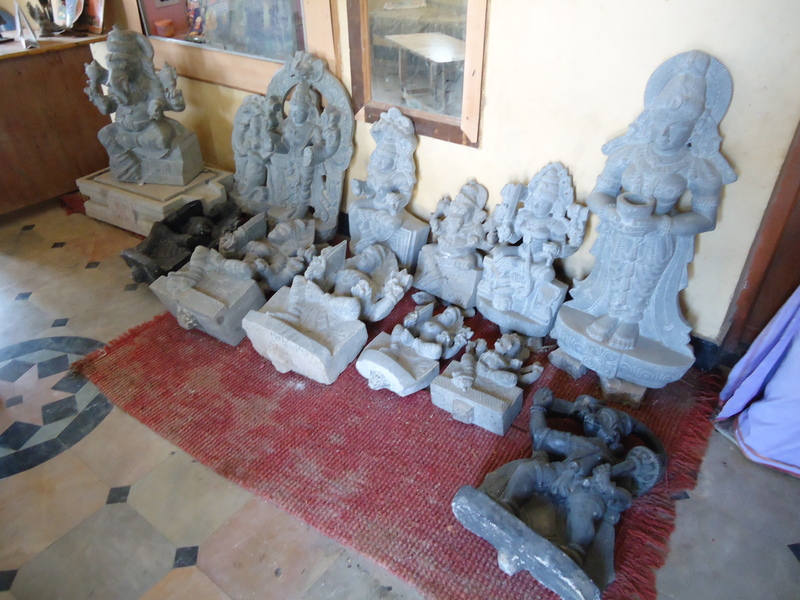 There were Gods’ sculptures all over made in black and white soapstone (steatite) and granite. 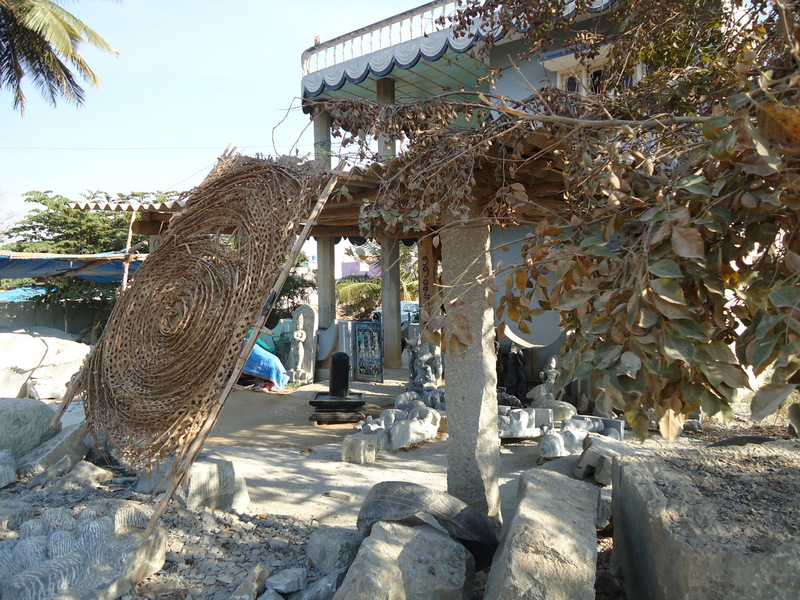 We entered the village and stopped at every house to gaze at the stone sculptures done by the artisans and talked to them. I discovered that stone craft is a rich craft and artisans were happy shaping the stones their way. 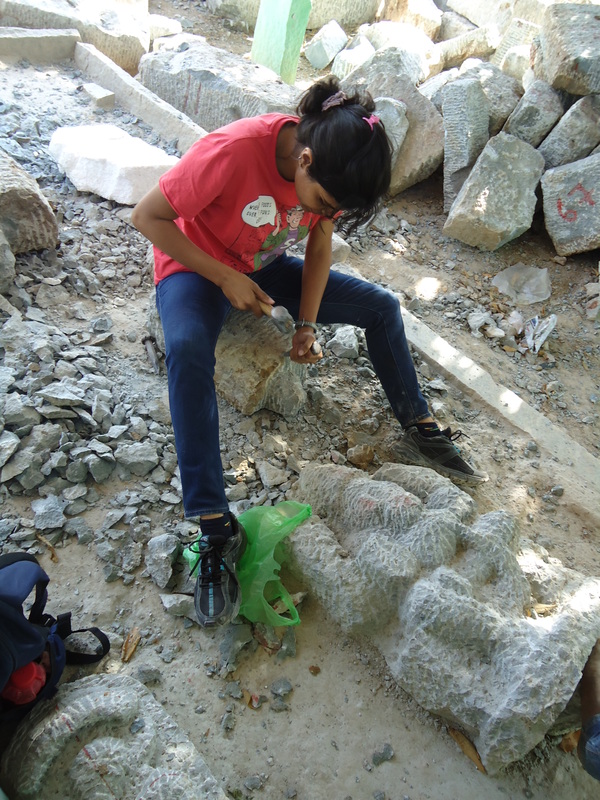 I learned the process of stone carving which is a combination of drawing on stone with red oxide solution and giving finesse to the stone with repeated action of drawing and sculpting. I also identified that the artisans there worked only on orders and produced sculptures as per the designs of the customers. 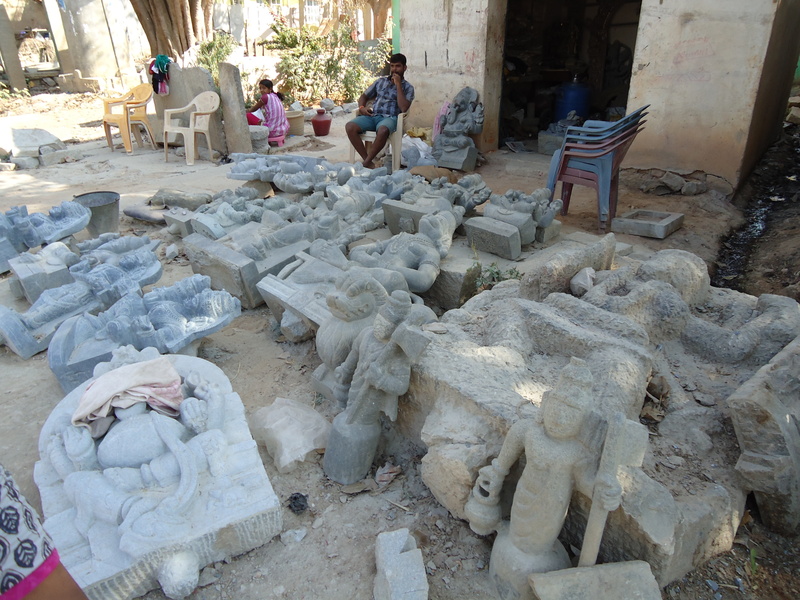 The raw material is bought by various artisans from different places in Karnataka. 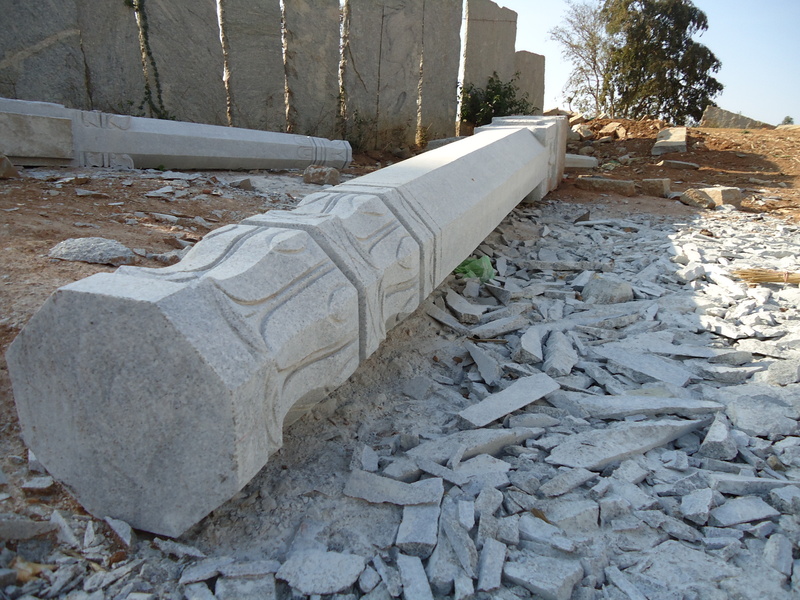 For getting the feel of the hardness of stone and to understand the difficulty level of stone carving, I tried my hand on it and remarked the softness of the stone which made it easy to carve. 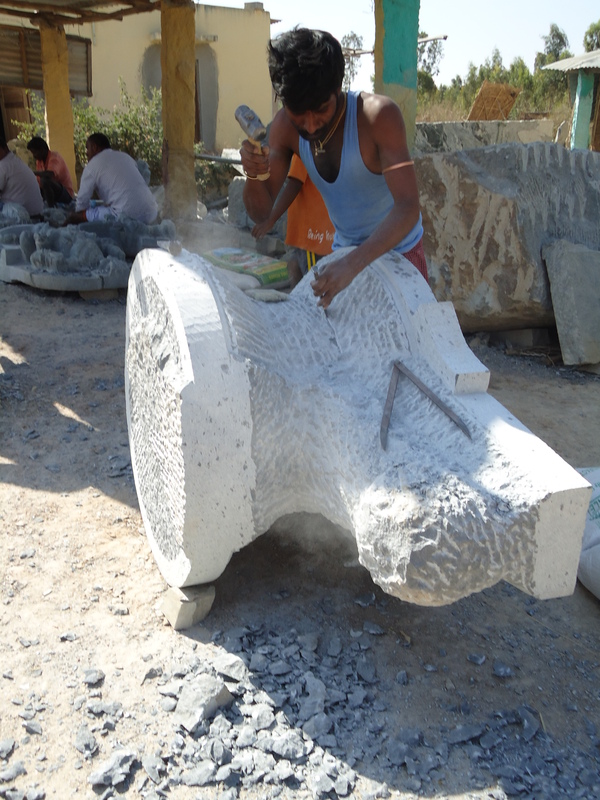 Carving required muscular strength to give the initial shape to the irregular shaped stone. The minute details and carvings is generally done by the females which demand less strength. 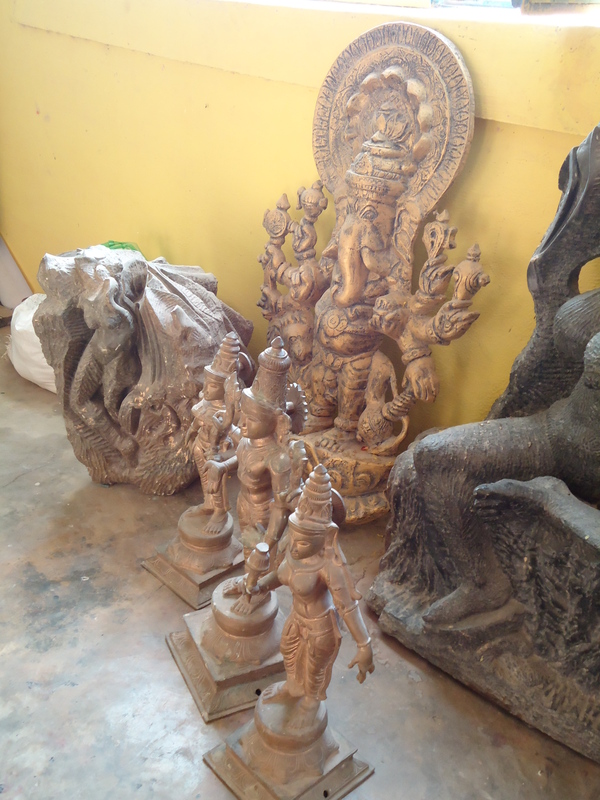 Shivarapatna is also a cluster for metal casting. The lost-wax method is used here for making brass sculptures. Artisans though work here only on orders and do not keep ready made pieces. Me and my friend walked along the street on which the village is situated. 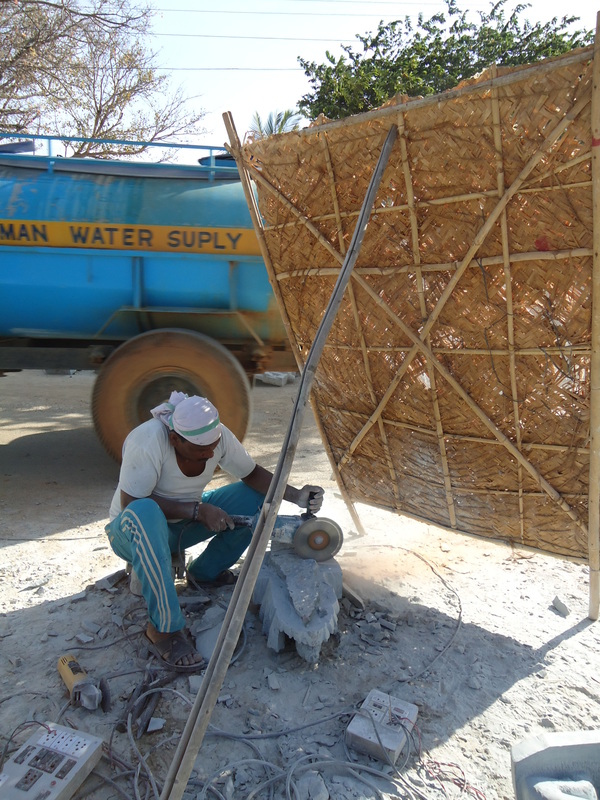 One distinctive thing I observed was the use of bamboo to create screen like shelters for work. It was an amusing and lively experience to gaze at the omnipresent stone craft. I and Sree Lakshmi walked back till the village entrance and waited for another auto ride. Never had I thought that the approaching ride would be like flying in the air. I stood on the foot rest outside the auto and flew in the direction opposite to the direction of the journey. I was delighted to be there and feel the air gushing in my clothes and my body while I stood on the footrest and was overwhelmed about the fact that there was no seat for me inside the rickshaw which was preoccupied with 17 passengers and my friend just managed to fit in. As always the case is, the road back to home is smaller than getting out. We managed to reach back to Bangalore by 7:30 in the evening and headed back home. ← ALBATROSS…A feeling for my work towards them!